Intra-oral cameras are tiny digital instruments that fit comfortably in your mouth and enable us to show you an enlarged image of your teeth on a computer screen. Enabling our patients to actually see what we see is a huge benefit when it comes to communication. Intra-oral cameras are tiny digital instruments that fit comfortably in your mouth and enable the dentist to show you an enlarged image of your teeth on a computer screen. This technology helps by clearly defining images and details that may be missed by standard mirror examinations. Our patients find it educational and can see the inside of their mouth and follow the progression of their dental procedure. The intra-oral camera may reveal the early stages of potentially serious problems where pain is a latent indicator of a problem. 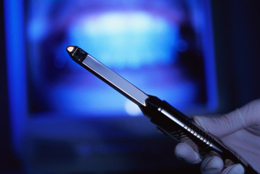 It allows us to store photos of the inside of your mouth for evaluation and review. Advanced Technology….Surgical Loupes….Digital X-rays….Intraoral Camera….